The python and the king cobra are two of the world’s largest and deadliest reptiles. The king cobra, being the longest and venomous snake can easily bring down an elephant. Similarly, the reticulated python is known to be the longest living snake specie and can squeeze their prey, including humans, dead within minutes. Despite their not so friendly reputation, some individuals take care of them as pets. Regarding their differences, pythons are nonvenomous constrictors while the king cobra is known for its lethal poison. Also, pythons are often bigger, longer, and camouflage while king cobras are much more agile. The following discussions further look into their distinctions. “Python” is Greek word which first appeared in the 1580s. It referred to the fabled serpent which was “slain by Apollo”. The monster’s features in the mythology is similar to its realistic descriptions which are enormous and treacherous. They may reach up to more than nine meters in length; hence, their size makes them move slower. However, they rely on their camouflage, patience, and strength in hunting for their prey. What is a King Cobra? The species name of King Cobra is Ophiophagus hannah which came from the Greek words, “ophio” for “snake”, and “phagus” for “eater”, hence, “snake eater”. “Hannah” is derived from Greek mythology’s tree-dwelling nymphs. It is also known as “Hamadryad”, a nymph who lives in trees in Greek and Roman mythology. True to its name, the King Cobra is known to be an arboreal imposing reptile which eats other snakes. Being a “king”, it can also eat other cobras. 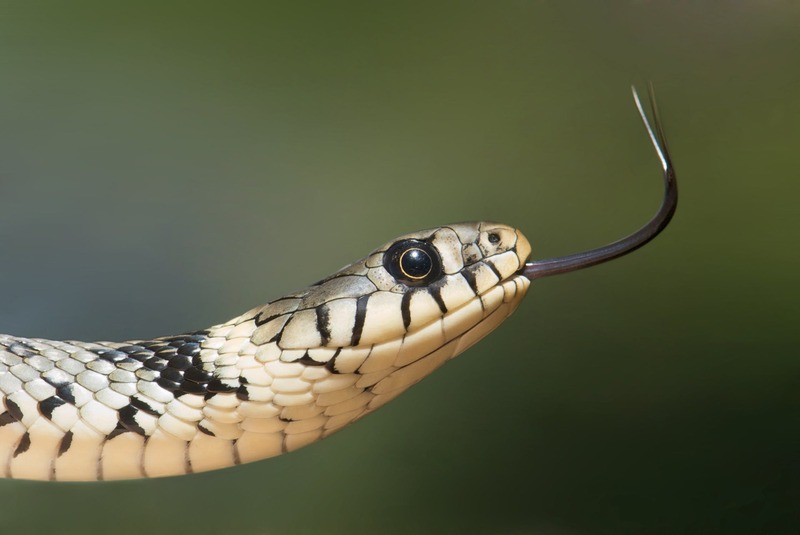 Moreover, its name came from the Portuguese, “cobra de capello” which literally means “hooded snake”. The King Cobra is generally larger as compared to other cobras and is often found in the forests of South and Southeast Asia. Its length can reach up to more than five meters which makes it the longest venomous snake. 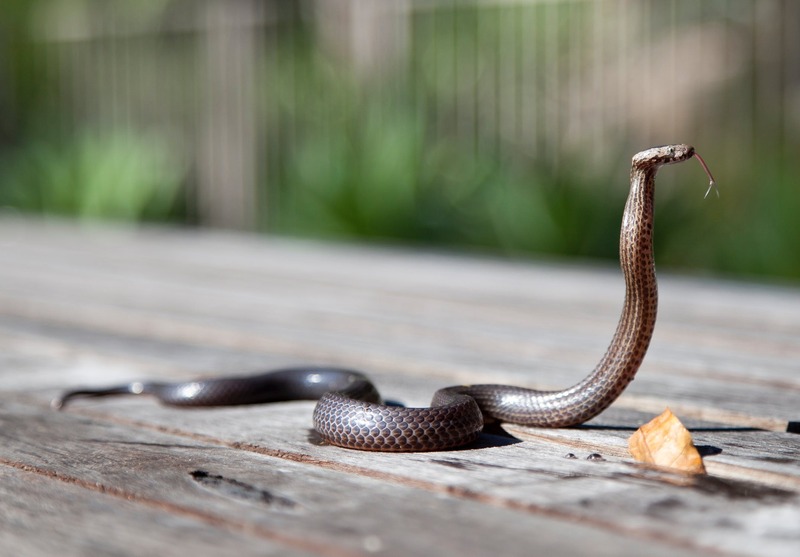 Showcasing the typical cobra stance, it raises its head and front part while expanding its neck hood when threatened. Its bite is extremely fatal as its venom can kill a large animal such as an elephant in several hours by delivering high quantities of paralysis-inducing neurotoxins. Unfortunately, around 50% of untreated human cases eventually lead to death. As one of the Elapids, the King Cobra kills its prey through its venom which is injected through its hollow fangs while pythons rely on their abilities to camouflage, wait, and strength in constricting. Moreover, cobras can usually move faster due to their smaller size, hence, they are known to follow and chase their prey. The longest python according to Guinness world record is a reticulated python at 25.2 feet. On the other hand, the longest known King Cobra measured (not by Guinness) is 19.2 feet. Pythons are often found in some parts of Asia, Australia, and Africa such as Nepal, China, India, Madagascar, and Sahara, while the King Cobra’s geographical distribution is more limited to some countries in South and Southeast Asia such as Vietnam, Indonesia, Pakistan, Laos, and Myanmar. Unlike pythons, the King Cobra has a more iconic image with its threatening expanding hood and prideful upright posture. It is also associated with elegance and grace in performances of snake charmers. Contrary to popular perception, the king cobra could not actually hear the music as it is merely enticed by the shape and movement of the flute. Pythons are generally patterned scales from solid brown to bright green or yellow. King cobras are usually having light or dark brown, yellow, black, or light green shades. Though both snakes generally have various colors, King Cobras usually have white or yellow chevrons. Pythons tend to prey on larger animals and mammals like pigs and antelopes while King Cobras usually eat cold-blooded animals as well as other snakes. Unlike pythons, the King Cobra is the only known snake to make nests for its eggs. As compared to cobras, pythons move slower due their size. They move in a rectilinear progression which means that they forward in a straight line by stiffening their ribs then lifting and pushing their bellies. Their estimated speed is only one mile per hour. As for king cobras, they often use the serpentine method, otherwise known as lateral undulation, which is the usual wavy motion. They can move for around three to five miles per hour. The python and the king cobra are two of the world’s largest and deadliest reptiles. Pythons are nonvenomous constrictors while King Cobras are fast-moving venomous snakes. Pythons are generally longer than King Cobras. Pythons’ geographical distribution are in Asia, Australia, and Africa while King Cobras are only usually found in south and southeast Asia. Unlike pythons, King Cobras have white or yellow chevrons. Pythons usually prey on bigger mammals while King Cobras eat smaller animals as well as other snakes. Unlike pythons, King Cobras make nests. gene balinggan. "Difference between Python and King Cobra." DifferenceBetween.net. 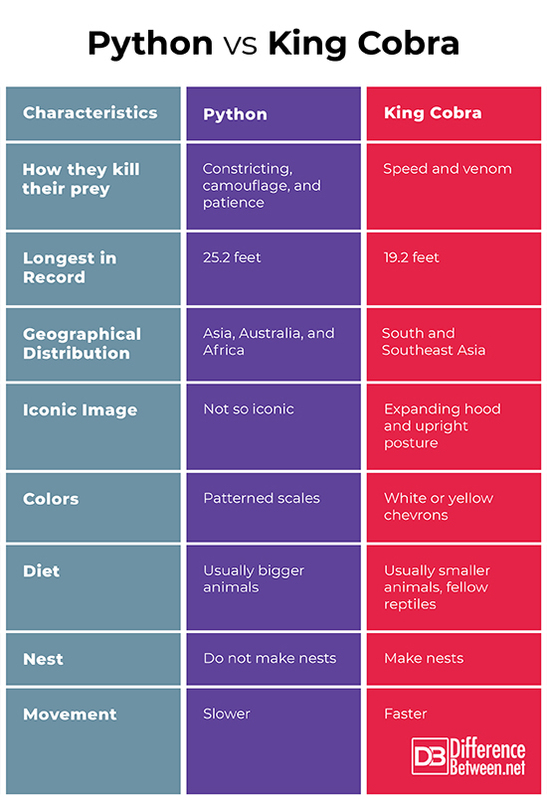 January 10, 2019 < http://www.differencebetween.net/science/nature/difference-between-python-and-king-cobra/ >. Hesper, Sam. King Cobras. New York: PowerKids Press, 2015. Print. Twigger, Robert. Big Snake. New York: William Morrow, 2000. Print.